Some courses such as independent study, thesis, and dissertation credits are offered for a variable number of credits (whole credits only). See the department to obtain the appropriate number of credits and the faculty code to register for the course on MyUW. Beginning the third week of the quarter through the last day of instruction for the quarter, all variable credit changes require the signature of the instructor by completing the Changes in Variable Credits section of the Registration Transaction form and submitting to the Registration Office either in person at 225 Schmitz Hall or via email to regoff@uw.edu. 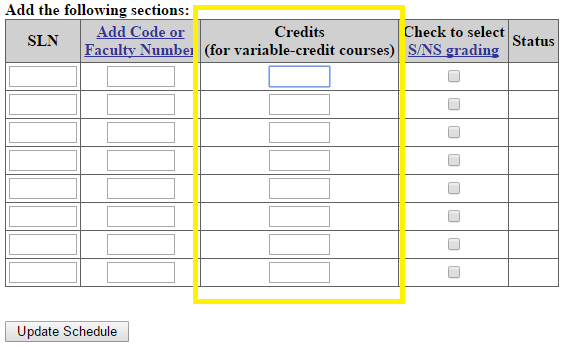 Before the third week of the quarter, variable credit changes must be made by adding and dropping the course on MyUW. Beginning the second week of the quarter, a Change of Registration Service Fee is assessed for all changes.